I don’t know about you, but whenever I can’t decide on what to wear, I always gravitate towards a neutral look. Neutrals are always chic and they look great with other neutrals or colors. One of my favorite neutrals is camel or tan, and I tend to wear a lot of this color with denim, blacks, grays or even whites. Today I have a new fun cardigan for you to wear now and take into spring. I am calling it our Jute Knit Hooded Cardigan. The jute color is very similar to a camel and the reason I decided to call it jute was the texture of the cardigan. It is made out of a textured yarn and knitted in a rib pattern so when I first saw it, I automatically thought of Jute. But this is only for color reference as the yarn is super soft. The body is semi loose but not over sized, with long sleeves, two pockets and a fun hood. I am wearing it with our Oatmeal Round Neck Side Twist Top which I debuted for you a few weeks ago here. The oatmeal color looks great with this jute cardigan. The top is made out of rayon modal jersey with long sleeves and a trendy side twist detail. 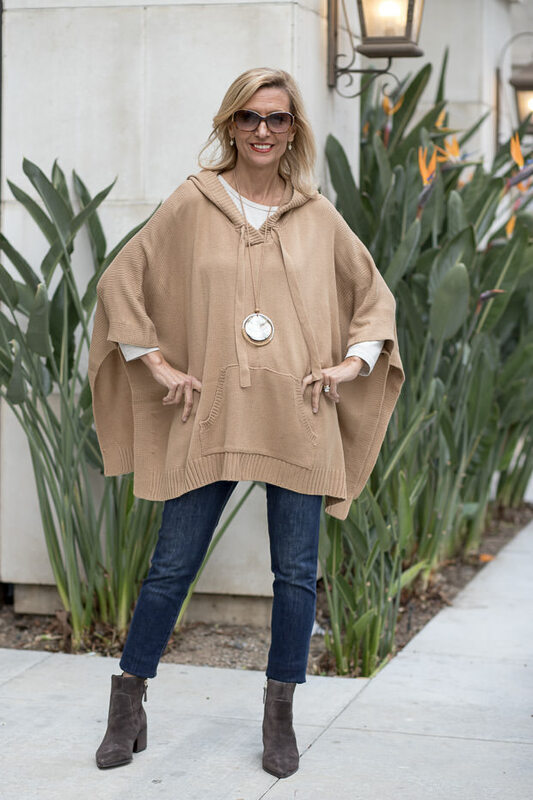 Since I was doing neutrals, I decided to style our Camel Hooded Knit Poncho for a second time. I first styled this fun piece here and we sold quite a few of them. It is a great piece to wear instead of a sweater or cardigan. You can throw it over a light weight top or even a sweater. We only have a few pieces left in this piece. As for jewelry today I have the perfect new necklace that looks great with all these pieces. 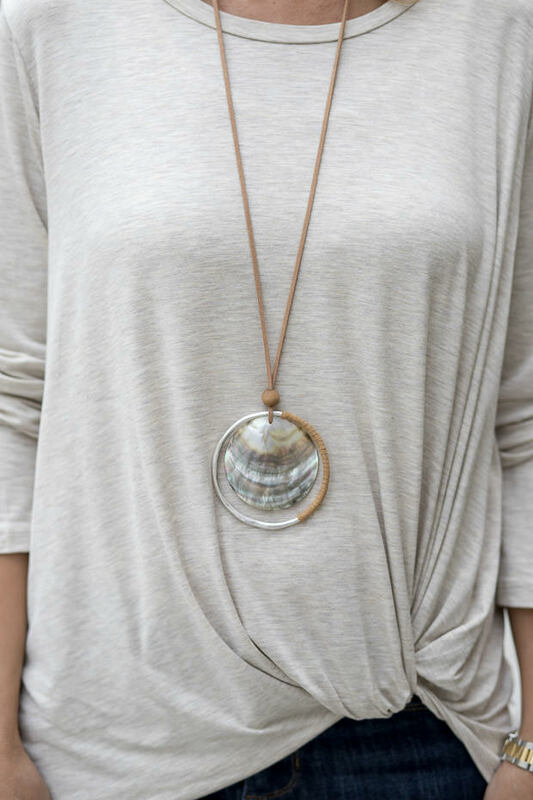 Our Tan Faux Leather String Necklace with Abalone Shell Pendant. This necklace is a statement piece that can make any outfit look more stylish. All four pieces I am wearing today are part of our Weekend Flash Sale where you can get 15% off with code FS22 plus Free US Shipping. All international shipments are a flat rate of $25.00. Neutrals look so good on you with the colour of your hair and the colour of your skin. And what a fabulous necklace! Thank you, I love wearing neutrals especially camel. You look great no matter what you wear. Neutrals are no exception! I love neutrals too, and the tied top is a great pieces to layer over. I may have to add one or two to my closet. Love those grey booties too!